Dogs and kids are an important part of making a house into a home, but they can be rough on your floors. Installing new flooring can be expensive, so it’s important that your floors last you for years. Luckily, there are durable flooring options that can stand up to years of heavy use. Price and durability vary based on the type of wood you choose. 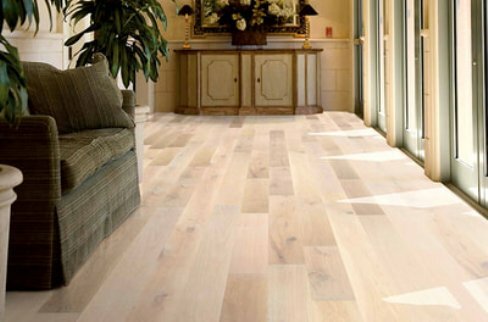 More expensive hardwoods like Monarch Plank European oak are more resistant to scratching, but all hardwood can scratch and suffer water damage. That said, hardwood is easy to clean and holds heat in well during the winter. It also has a major advantage: you can sand it down and refinish it multiple times. Since it only needs to be refinished about every ten years, hardwood can easily last four decades or more. This saves you money and allows you to restain your floor a different color if you wish. Porcelain, ceramic and stone tiles are often great choices for durability. They’re very easy to clean and maintain, and most don’t scratch easily. Some types of stone, like marble, are beautiful but need to be sealed annually, as they’re prone to staining and scratching, so pay attention to how hard or porous they are before you make your choice. Additionally, tile is cold in the winter, so consider laying out carpets for you and your pets to walk on or investing in heated floors, which work great with tile. This environmentally-friendly option is incredibly popular, especially in homes with many pets. Its durability rating on the Janka scale is higher than traditional construction bamboo, rating anywhere from 2000 to 3200. This means it’s very stain and scratch resistant, as well as easy to clean, and it holds warmth well during winter. Modern technology has enabled the production of more durable materials that will withstand years of hard use. This will allow you to focus on what matters: life. You can wrangle your kids or chase your dogs without worrying what the chaos is doing to your floors.